The president of the U.N. Security Council said Monday that many members are pressing to follow up on last week’s resolution to eliminate Syria’s chemical weapons with a demand that the government allow immediate access for desperately needed humanitarian aid. Australian Ambassador and council president Gary Quinlan said a draft Security Council statement calls for delivering access in “the most effective ways, including across conflict lines and, where appropriate, across borders from neighboring countries …” if necessary to bypass meddling from President Bashar Assad’s regime in Damascus. Russian Ambassador Vitaly Churkin told The Associated Press that Russia approved of the draft statement on humanitarian aid as well. 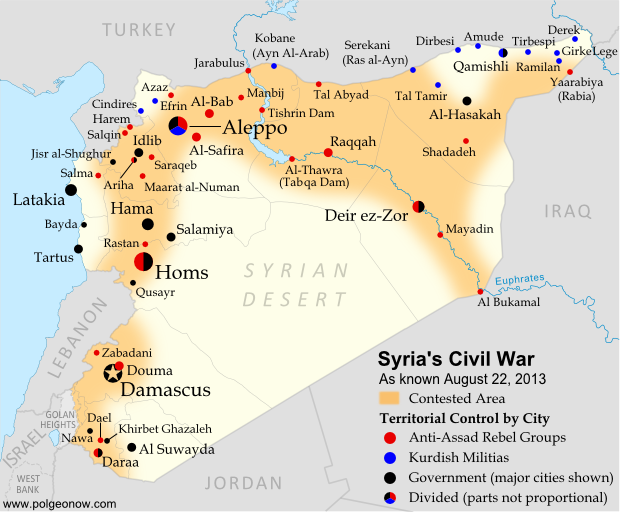 As the map shows, a majority of border towns and cities are held by rebels or Kurds. So if the UN tries to open up humanitarian corridors from other countries, the burden will be on the rebels to safeguard them. There are notable exceptions, like Qusayr. But Russia can support this initiative safe in the knowledge that (1) it reflects facts on the ground and (2) it may create more headaches for the rebels than for Assad. Will rebels let aid into government-held areas? This entry was posted in Conflict and security, Middle East and North Africa by Richard Gowan. Bookmark the permalink.